Listening to TSN 1040 on my way to work every morning and on my way back home, I have developed an appreciation for Ray Ferraro. I liked him as a player with his tenacity and scoring ability, but as a broadcaster, I enjoy his honesty, knowledge and unfiltered rawness. 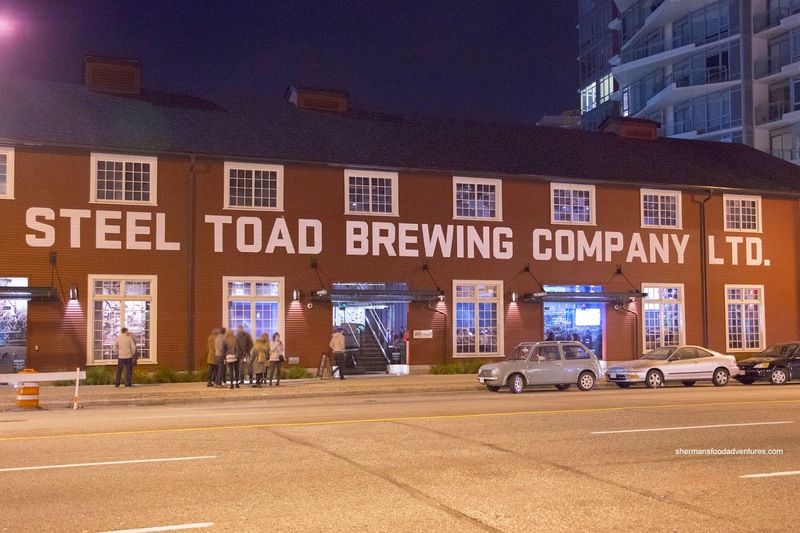 So when he professed his love for the Steel Toad Brewery, I just had to trust him right? Well, I'm sure he gets paid to endorse the place, but whatever, Costanza and I were pretty much curious despite what others have said. With that in mind, we were smart enough to make a rez on a game night because the place was packed. Seeing how we couldn't decide what brew to order, we all had the Taster except for Elaine. She ordered some sissy drink instead. Pffft... With 2 tasters to choose from, Viv and I went for one option each. 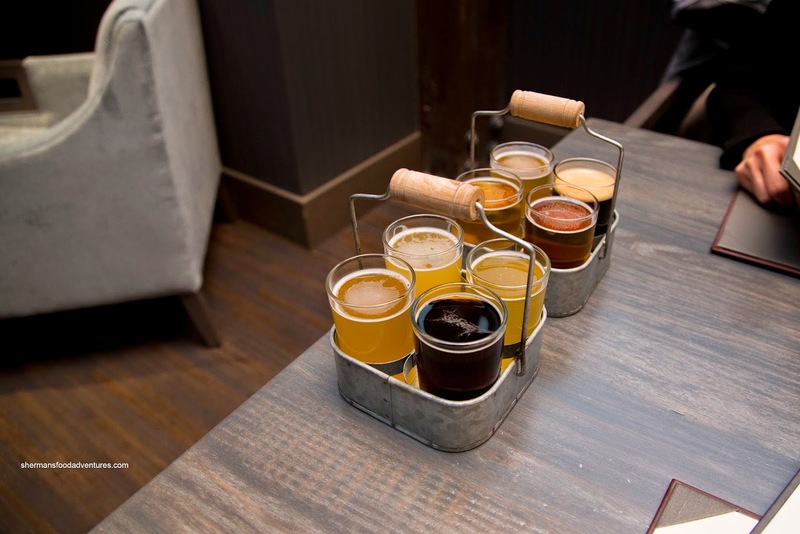 For my Pack B, starting from top left and clockwise, I had the Withier, Berliner Weisse, Brown Ale and Brett Saisson. Viv's Pack A from bottom right and clockwise, she sampled the Blonde, Saison Sauvignon, Westcoast IPA and Oatmeal Stout. The highlights from the bunch were the Brown Ale (nutty and hoppy), Blonde (hoppy with a caramel finish) and Withier (light and almost floral). Subjectively, we universally weren't liking the Berliner Weisse as it was sour and too fruity. 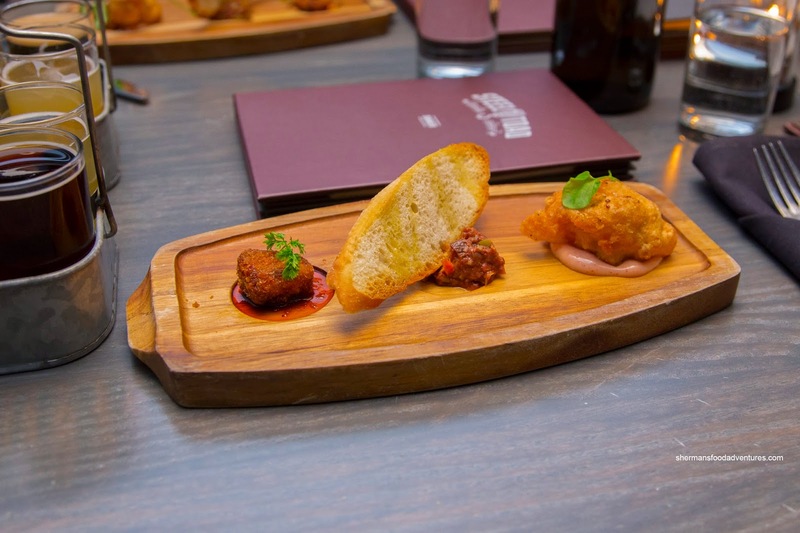 Onto the food, we were surprised with an Amuse Bouche consisting of Korean Pork Krometsky, Tapenade and Cauliflower Beignet (was it my camera?). Although a bit salty, the pork was crispy on the outside and moist on the inside. I liked the tapenade since it was not overly salty and ended with an aromatic olive finish. Also, something about the chunky texture won me over. I wasn't a huge fan of the beignet as the dough was pretty dense. Inside, the big piece of firm cauliflower made the thing clunky to eat. Maybe something a bit smaller, like the poppers at Abode might've been a better idea. 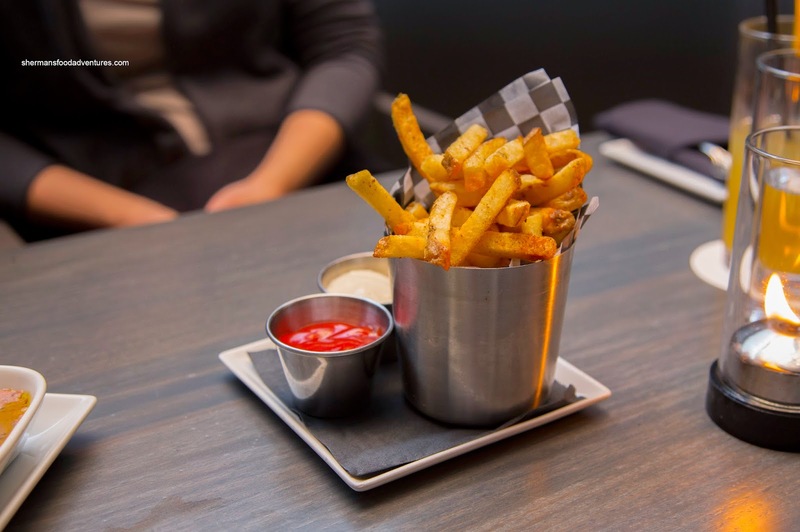 Now with the food we actually ordered, I dug into the Hand Cut Fries with beef salt and garlic aioli. Crispy, light and just kissed with enough beef salt, we could've had a few more order of these. Due to the unexpected complimentary amuse, we had to change our original choices of appies. So we went with the Chicken Wings with BBQ sauce. 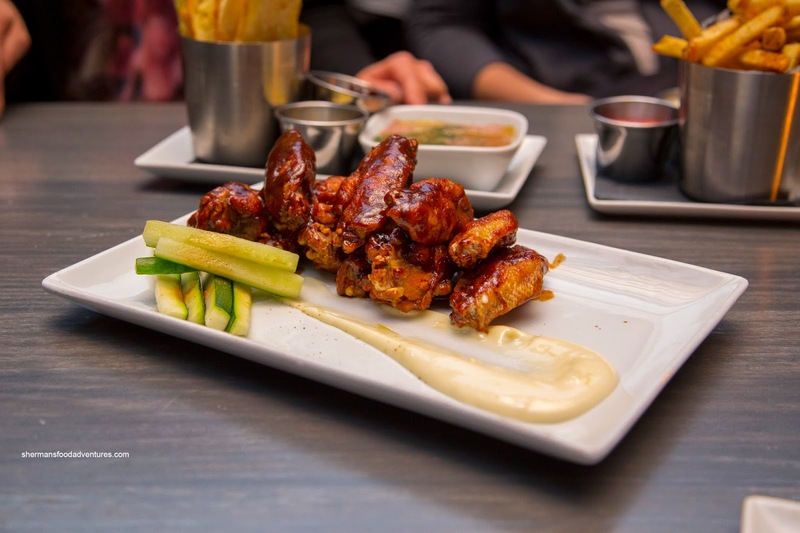 Nicely plated, the wings exhibited a crispy exterior with well-rendered skin. However, that translated to a pretty dry wing overall where the meat was a touch chewy in parts. As for the BBQ sauce, it was rather sweet and lacked any real impact. It needed more acidity and smokiness. 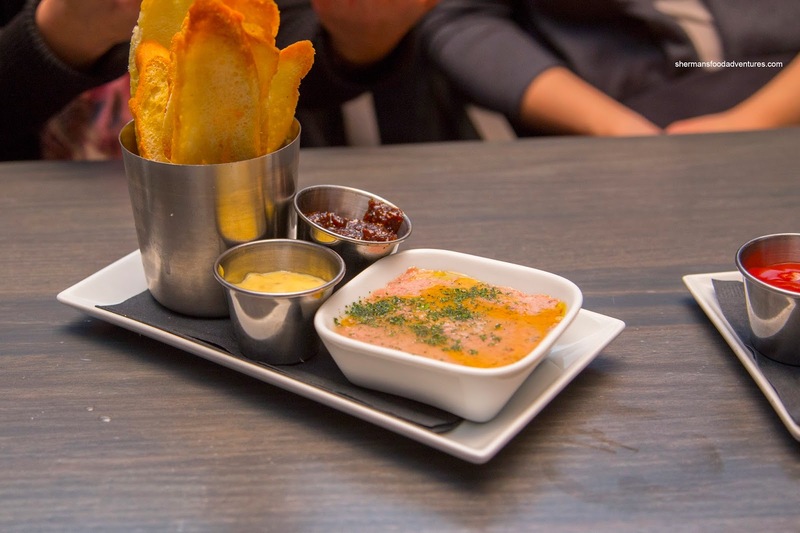 Next up, we tried the Duck Rillettes with fig marmalade, ale mustard and thin crostinis. We enjoyed the texture of the rillette where it rode the fine line between being too mushy and being too chunky. Although duck in texture, we would've liked to see the flavours more pronounced as it was pretty mild. On the other hand, the condiments did amp up the sweetness and sharpness. 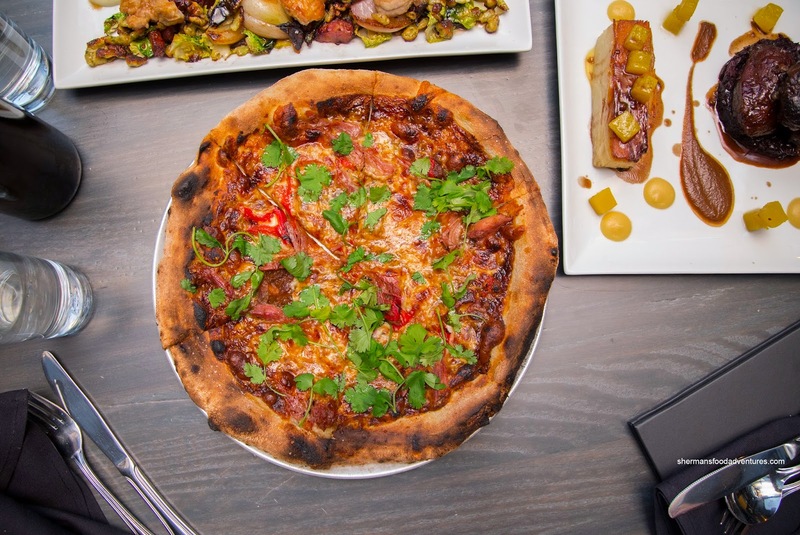 Onto our mains, we went for the Duck Confit Pizza featuring BBQ sauce, roasted red pepper, caramelized onion and cilantro. Again, with the same BBQ sauce, the pizza ate pretty sweet. Near the centre, the excess moisture resulted in a wet and limp crust. However, as we moved to the outside of the pizza, the crust was nicely charred with a crispy chew. We felt the duck was MIA as the BBQ sauce overwhelmed all other flavours including the cilantro. 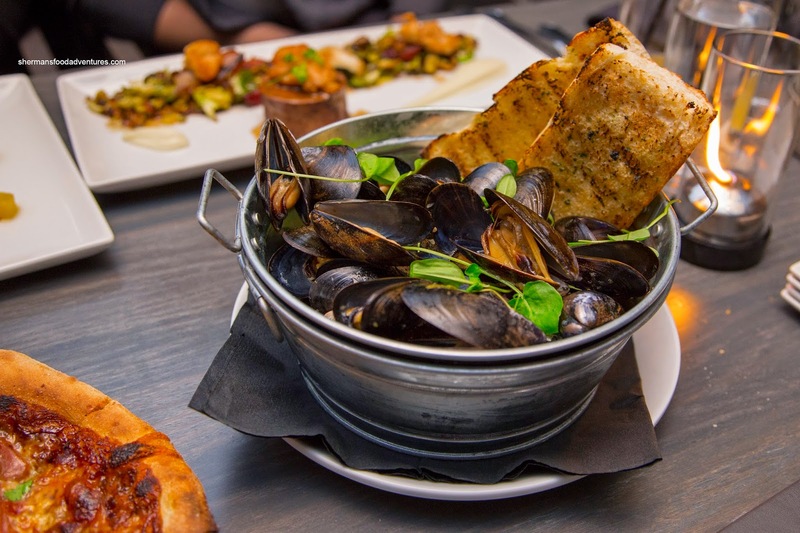 Served in an aluminum tub, the Mussels & House Ale were served with 2 large pieces of grilled garlic baguette. Due to the type of mussels used, the meat was pretty small. With that being said, we felt the dish was prepared properly as the mussels were buttery and sweet. The broth was a bit mild though and could've used more hints of ale and seasoning. 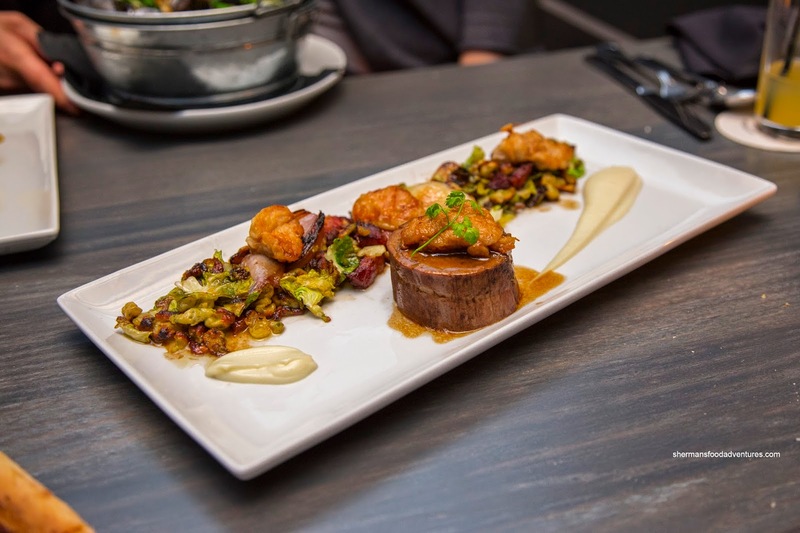 With 2 more "refined" dishes, we began with the Veal Breast & Sweetbreads accompanied by cauliflower, bacon, shallots and spätzle. The veal itself was natural-tasting with an appealing meatiness and a small amount of fat. However, the meat was a bit dry. As for the sweetbreads, they were good with a buttery succulence. As much as we enjoyed the chewy and crispy spätzle spiked with the saltiness of bacon and a balancing acidity, the entire concoction was pretty greasy. Next, we sampled the Honey & Clove Pork Cheeks with potato Dauphinoise, smoked soubise, red cabbage and golden beet root. 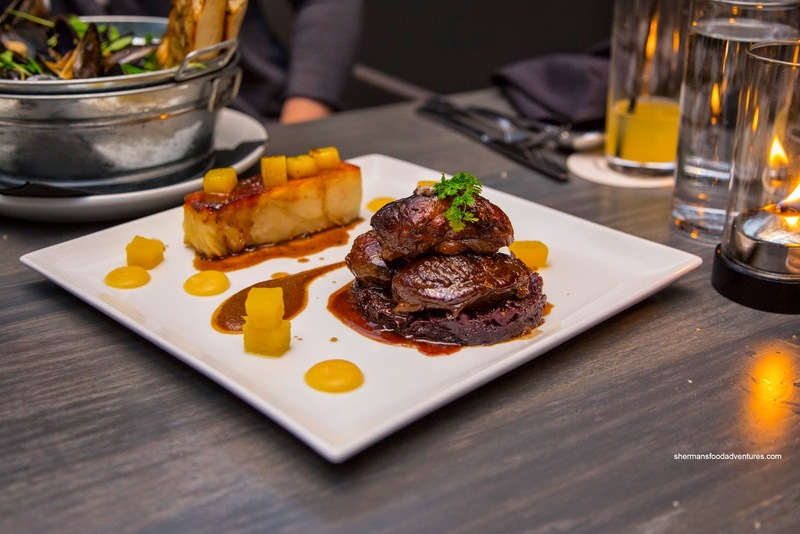 Moist, slightly gelatinous and succulent, the pork cheeks emitted a hint of clove. However, we felt they should've been a more aggressive sprinkle of soubise. The parts that were kissed by the smoked onion salt had an elevated meatiness where it brought out all the other flavours. 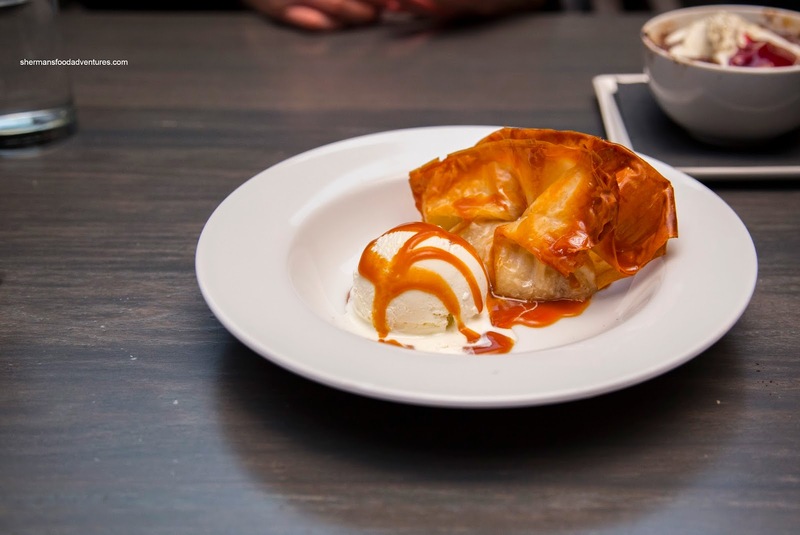 For dessert, we tried the Warm Apple & Phyllo Purse with vanilla bean gelato and caramel sauce first. Crispy and a bit nutty from the browning, the phyllo revealed chunks of firm apples that were somewhat tart and moderately sweet. This was a simple dessert that was okay, but I would've liked to see the apples cooked down a bit further. 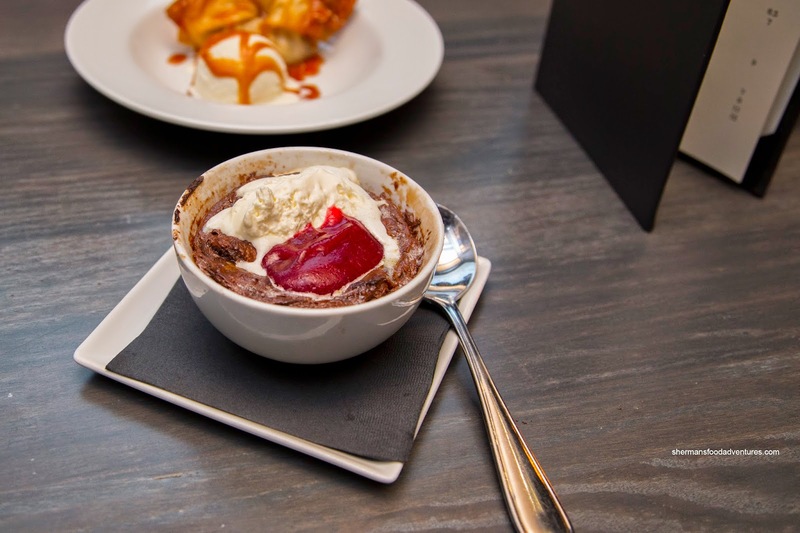 Lastly, we had the Chocolate Bread Pudding with mascarpone and cranberry coulis. Costanza and I thought the pudding was a bit too wet. It wasn't overly sweet though and could've used more chocolate. The cranberry coulis, in our opinion, was far too tart and overwhelmed the already mild-tasting pudding. As you can probably guess, the food was a bit hit and miss. However, the place has enormous potential as the building is gorgeous and the vibe is lively without being overwhelming.